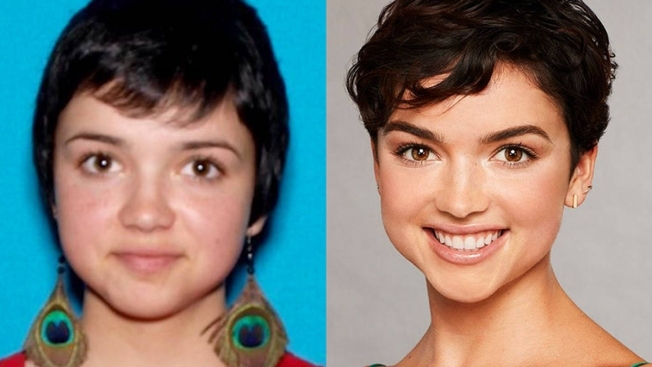 The nanny from Fresno was reported missing by her mother in November after she went to Humboldt County "to work on a marijuana farm"
Rebekah Martinez in her driver's license photo, left, and as Bekah M. on "The Bachelor," right. On Thursday, a post on the Facebook page of the North Coast Journal showcased a collage of photos of people reported missing in Humboldt County, California, along with the question, "See anyone you recognize?" "Yep," replied one user. "Rebekah Martinez is on this season of The Bachelor...."
Indeed, season 22 contestant "Bekah M." was on the missing persons list. The California Attorney General's website featured an entry for the 22-year-old reality star, who is seen in a photo wearing peacock feather earrings. It said she was last seen Nov. 12. Martinez, a nanny from Fresno, California, was actually seen just last Monday — onscreen in a "Bachelor" episode. She has also remained active for months on Instagram and Twitter, which is where she addressed the issue of her being "missing" by cracking a joke. "MOM. how many times do I have to tell you I don't get cell service on The Bachelor??" she tweeted Friday. "Honestly the scariest thing about this story is that my efforts to conceal The Worst Drivers License Photo Of All Time have been thwarted," she added. "Let's play a game: Russian nesting doll or Bachelor contestant?" The Humboldt County Sheriff's office said Martinez's mother had reported her missing on Nov. 18, after Martinez had told her mom on Nov. 12 that she was going to Humboldt County "to work on a marijuana farm." Unable to reach her daughter after the initial contact, her mother reported Martinez missing in Humboldt County. And even though she'd since then talked to her daughter, she said she was unable to reach the sheriff's office to tell them Martinez was no longer missing. The Humboldt County Sheriff's Office said that once a deputy had spoken directly to Martinez on the phone, she was removed from the missing persons list. Martinez had said on Instagram on Sept. 17, "HI ALL I'm giving up my phone and social media for the next several weeks, so if you need to contact me, welll... tough luck!" Martinez returned to the social network on Nov. 22 and announced the following month that she would appear on the new season of "The Bachelor," which premiered on Jan. 1. Filming on the current season of "The Bachelor" began in September. Most of Martinez's co-stars also took a social media break between then and November.